Mega Bloks are a popular toy in our house. They get played with almost every day. 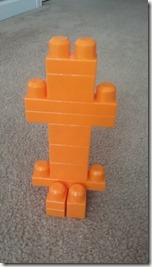 As a result, I’ve come across many ways to integrate learning and play with the blocks. Most of these activities have occurred naturally while playing. 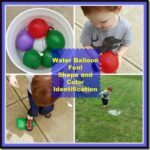 They don’t require any prep work and your child won’t feel like they are being forced to “do school.” Learning through play is so much easier for you and your child. 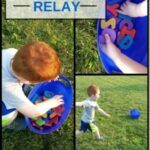 So next time you are playing with blocks, try some of these activities out and have fun while learning! 1. 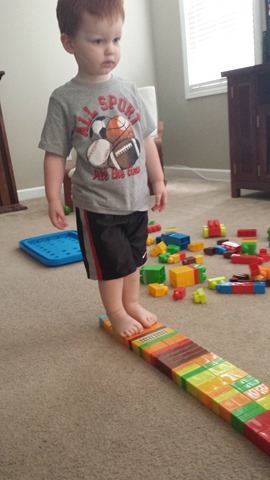 Color sorting – Pour all of the blocks out over a large area and have your toddler race around to collect the blocks and sort them into piles by color. 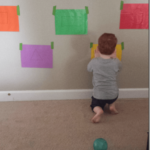 This is great way to learn colors and practice sorting. 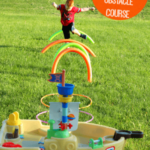 It also provides gross motor activity and exercise. I’m a big believer in “Action Based” learning and often try to integrate learning and movement. This type of learning is very appealing to Evan as well. 3. 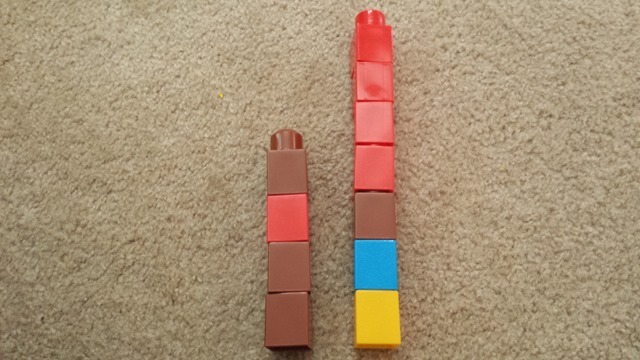 Big/Small or Tall/Short – Make 2 towers of differing sizes and discuss which is bigger and which is smaller. You can also discuss tall vs. short. For instance, I might ask Evan to make a tower and then I will make one at the same time. 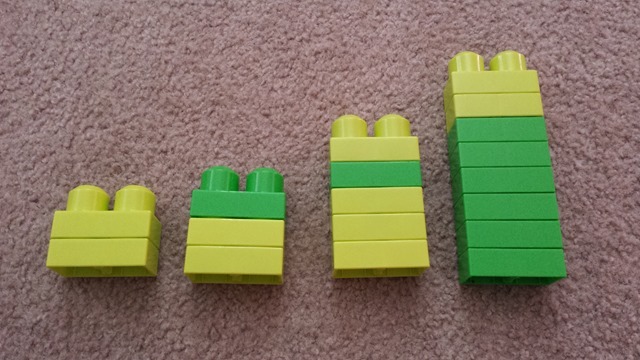 Then I will ask him which one is taller, smaller, bigger, shorter at various intervals of making the towers. 4. 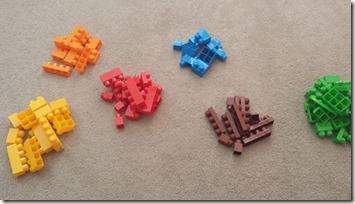 Counting – We often count while playing with Mega Bloks. Sometimes we will just count as we are placing the blocks on the structure. Other times I will ask Evan to count how many blocks are in a tower we make. There are so many ways to integrate counting and play with blocks. 5. 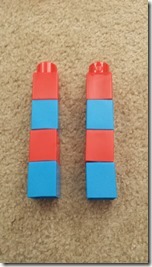 Patterning – Blocks are great for patterning activities. At this point, Evan isn’t able to match a pattern I make or make one on his own, but there are still many ways to introduce and practice patterning. 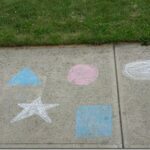 I just make patterns while we are building and speak the patterns out loud as I go. 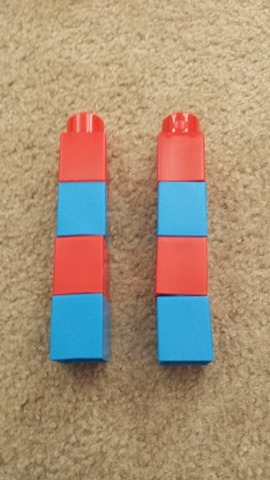 For instance, I will say “I am going to make a tower with the pattern red, blue, red, blue.” Then I will place the red block and say “red.” Then the blue block on top while I say “blue.” This continues over and over until I am done. 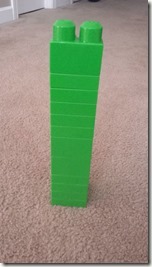 After I have the pattern tower made, I will have Evan say the pattern out loud to me as we point to each block. 6. 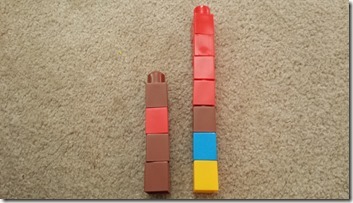 Ordering – For this activity, I simply make towers of varying sizes and ask Evan to put them in order from biggest to smallest or smallest to biggest, etc. 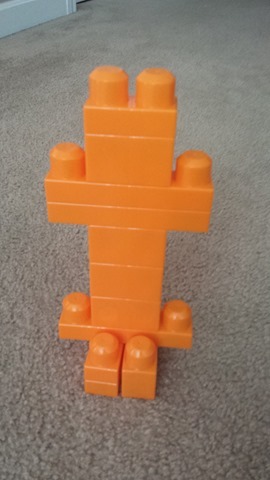 If your child is just learning this skill, you can ask “Which tower is the smallest?” and then lay that one down in another area of your floor. Then say “Which one left is the smallest?” and then place that one after the first you laid down. Continue until you have the towers in order on the other area of the floor. Eventually your child will understand what you want them to do when you ask them to put them in order. 7. 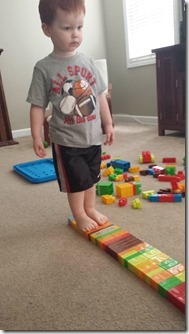 Balance (Walk the Plank) – This was a fun one for Evan! The picture explains it all. This is a great way to work on balance. Evan likes to pretend it is a bridge or plank and there are crocodiles on either side! 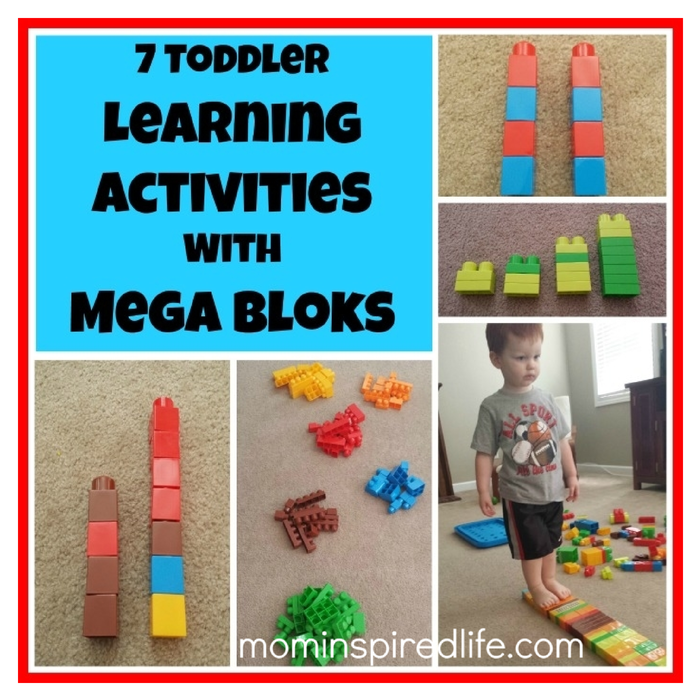 Does your young toddler enjoy playing with Mega Bloks? Have you found any other ways to incorporate learning with Mega Bloks? Please leave a comment and share! 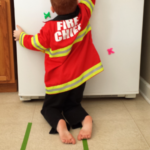 For more playful preschool activities like this one, check out my preschool Pinterest board!